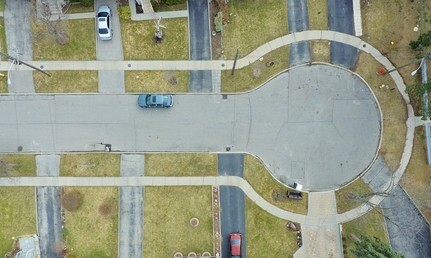 Case Study: Water Main Replacement Mapped by Drones | Enaeria Inc.
Graylee Avenue is a 400m long residential roadway in Scarborough, ON. The bungalow homes on this street were built in the early 50’s when it was common practice to use lead pipes for water supply. There is a plan to replace the water mains in 2017, among other updates on the street. At some point towards the end of 2016, an underground surveyor marked the roadway and sidewalk to indicate various services. Water mains, gas lines, storm sewer lines, and sanitary sewer lines were marked on the road surface with various coloured paint. Unmanned Aerial Vehicle (UAV or drone) technology has evolved quite extensively over the last few years. Not only can drones take photographs from interesting perspectives but they can also be used to map the surface of a roadway. The UAV can only see what is on the surface, not what is underground. However, the paint markings on the surface of Graylee Avenue indicate where the underground services are located and therefore can be identified in the scan. We used a GPS receiver to obtain Ground Control Points (GCPs) or Benchmark Points. A drone scan was then completed in about 10 minutes by flying above the roadway at an altitude of 40m. 56 images were captured during two passes along the roadway. Data points were collected every 1.58cm (0.62in) across an area of about 6 acres. 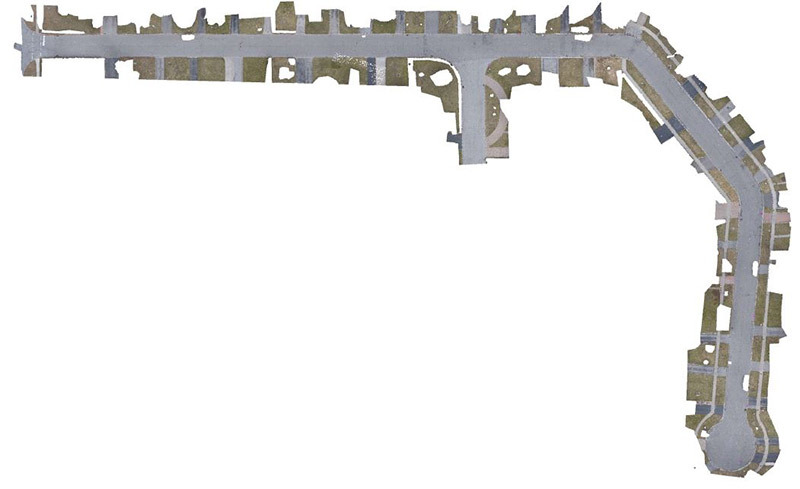 The raw data was then processed to build a 3D computer model that is scaled and positioned with 1 to 3cm accuracy in the horizontal and vertical plane. The 3D model is made up of 77,258,229 data points with an average density of 10,452 points per metre cubed. Having this resolution enables us to create drawings based on the model. The above video illustrates the point cloud of the model as well as the Digital Terrain Model (DTM). 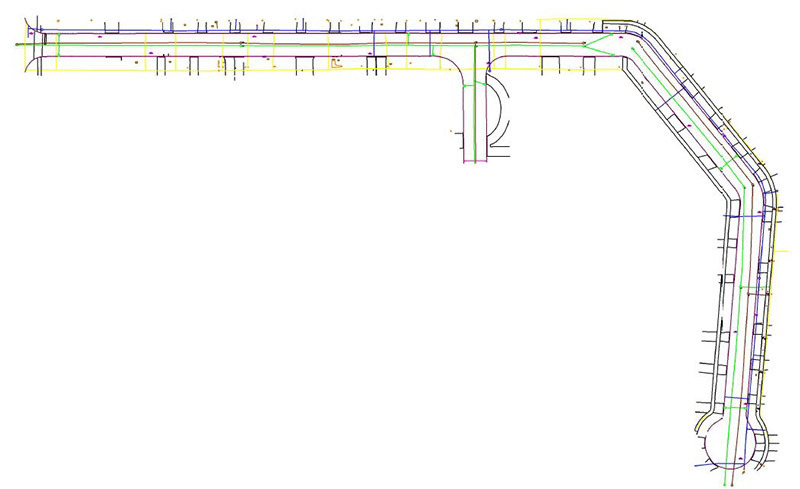 We created a CAD drawing which included: curbs, sidewalks, driveways, electrical boxes, fire hydrants, manhole covers, and catch basins. Because of the roadway’s surface markings we were also able to locate: water mains, sanitary sewer lines, storm sewer lines, and gas lines. Lastly, the elevation data of each data point in the model can be used to create topographical maps of the street such as a contour map. The below slide show are screen captured images to illustrate the data collected. We would like to acknowledge Zafer Ata Ozcan and Four Season Site Development Ltd. for donating their time and GPS receiver to capture our benchmark data points. Brimley Rd. & Eglinton Ave. E.